What the Age of Revolution was to European society at large, the Café de la Régence era was to chess: the childhood of many of its characteristic present-day institutions. The chess club; the chess journal; the international chess match; sub-specialties such as imaginative writing on chess subjects, problem composition, and simultaneous blindfold exhibitions; the study and publication of systematic analyses as an essential part of mastering the game; and, in general, a commitment to chess commensurate with that to any art of science. These are some of the distinctive institutions of modern chess that took form during the Café de la Régence era. The glory years of the Café de la Régence, whose traditions prevailed until the new institutions established themselves, were indeed those of a regency. Before the Café de la Régence era, it had been aristocrats who constituted the social group in Europe most identified with chess; during that era, it was intellectuals; since then, it had been quite simply professional chess players. Before that era, many Europeans [and Americans - SBC] regarded chess as a mere game; during that era, a useful and meaningful game; since then, a serious pursuit. Before that era, ches was played by some people as symbolic war; during that era, by many officers as a pasttime; since then, by many people as a real battle for fame and fortune. In a broader societal context, out of the Café de la Régence period emerged the idea that chess greats are cultural heroes. A prominent French poet [M. Joseph Mery - SBC] wrote that Labourdonnais had avenged Waterloo with hid victory over MacDonnell in 1834. The French government bestowed a pension on Labourdonnais for his contribution to the national culture. Since then, becoming a great chess player has been regarded an accomplishment, without qualification. And one need not be a great chess player to justify taking a serious interest in the game. Playing chess has become a legitimate activity in and of itself. Prefaces to chess books no longer argue for the game as they once did, adducing such reasons as that it teaches military science or moral value. Arguments for chess, no longer deemed necessary, are no longer made. The development of the idea that playing chess is self-justifying ran parallel to or perhaps was an offshoot of the development of the idea of art for art's sake. It reached its epitome at the end of the nineteenth century in the formiula of Ernst Cassirer: "What chess has in common with science and fine art is its utter uselessness." In 1852, the Café de la Régence lost its original home on the place du Palais-Royal, where it had opened in 1681 as one of the first coffee-houses in Paris. It found temporary quarters on the rue de Richelieu for two years, then it moved permanently to the rue Saint-Honore, where it remains to this day, though under a different name. The removal of the café from its time-honored location symbolized its removal from the history of chess. When the immortal American master Morphy gave a fantastic exhibition in the café's new home in the late 1850s, playing eight blindfold games simultaneously, it was the visit of Morpheus, and the Café de la Régence has slept peacefully ever since. The Café de la Régence where Morphy gave his famous blindfold exhibition in 1858 was not the same Régence of Philidor and Bourdonnais. It had been relocated during the great rennovation of Paris instituted by Napoléon III in 1852. It was moved from it's original home on Place du Palais-Royal, where it had opened in 1681, to it's new home at Rue Saint-Honoré. It remained there until 1916. The Regency design was named after Café de La Régence.The Regency pieces were produced in the late 1700's untill 1890's. Earlier or more inexpensive sets had Knights without the traditional horse head, but rather turned pieces with notched collars to distinguish them from the Bishops. Latter sets had the more traditional horse head for the knight. The Regence set design is still being made in France and was promoted as a 'good' design in England as late as the 1930's. from the French wikipedia: One of Paris' leading cafés, it was established in 1681 under the name of the café de la Place du Palais-Royal [on the Place du Palais Royal, between the Palais Royal and the Louvre proper], then renamed in 1715 at the earliest to become the café de la Regence. During the redevelopment of the Place in 1852 it was temporarily relocated to the Dodun Hotel, rue de Richelieu [not far away]. From 1854 it was located at 161 Rue Saint-Honore where it has since been replaced by the Moroccan national tourism office. Before the Café de la Régence era, it had been aristocrats who constituted the social group in Europe most identified with chess; during that era, it was intellectuals; since then, it has been quite simply professional chess players. Before that era, many Europeans regarded chess as a mere game; during that era, a useful or meaningful game; since then, a serious pursuit. Before that era, chess was played by some people as symbolic war; during that era, by many army officers as a pastime; since then, by many people as a real battle for fame and fortune. The 18th century was self-styled as the The Age of Enlightenment. Although this movement encompassed Art, Music and Literature, it was more evident in the philosophers, scientists and social engineers of the time. For our purposes in discussing chess, the important factors are that the European intellectual center was now France and that chess, once simply considered a complex game, was embraced by the intellectuals who brought some of their powers for abstract thought to bear on chess. Chess was still considered a game, for sure, and as a game, only deserved a certain amount of one's time and energy, but, even so, they helped raise chess to a higher level, and essentially helped keep chess alive. In the previous half century, the popularity of chess had been waning and little was published and few new ideas had been advanced. Greco book was the chess bible and people memorized his games without understanding them. The understanding of chess started to become more significant as people more capable, and with more leisure time, took up the game. Much of the philosophic discussions and discourses took place in coffeehouses. In Paris, the most famous coffeehouse was the Café de la Régence. The Café de la Régence attracted the greatest minds and personages of the era: Diderot, Voltaire, Rousseau, Ben Franklin, Robespierre, a young Napoleon. They gathered to discuss ideas and to play chess. The greatest of the chess players was de Kermur, Sire de Légal who was soon to be supplanted by an even greater player: Francois-Andre Danican Philidor. Aaron Alexandre, a Bavarian trained as a rabbi, arrived in 1793. Gratified by the Revolutionaries’ policy of religious toleration he decided to become a French citizen. At first, he taught German for his livelihood, and made mechanical inventions and played chess as pastimes. Eventually, however, chess became his principal occupation. He set himself the task of making a complete survey of the openings that had been analyzed up to then, publishing his findings as the Encyclopédie des échecs (Encyclopedia of Chess, 1837). Then he made a survey of endgame analyses and a compilation of almost two thousand chess problems, which he published in London as The Beauties of Chess (1846). Both books set new standards of comprehensiveness for their specialties and showed Alexander’s great technical knowledge. In chess as in his other activities, he preferred erudition to performance. In the 1840s, French chess lost not only Labourdonnais but also an important correspondence match and the second international championship match. In the previous decade the Paris players had twice defeated the London players in correspondence games, that is, games played by mail, necessarily lasting many months, in which the moves were decided upon through consultation among the members of a team. But the Paris players’ century-long tradition of superiority proved to be a dead letter in the mid-1840s, when they lost two correspondence games to the Budapest team of József Szén, the victor over Labourdonnais in 1838, Vincenz Grimm, the pianist, and János Löwenthal. Deschapelles having long since retired. It was Saint-Amant who led the Paris club in its victories over the London club at correspondence chess. Labourdonnais’s death in 1840 made Saint-Amant the best active player in France and allowed him to become the editor of Le Palamède, still the only chess journal in Europe. His upward course continued in 1843 when he visited London and defeated Staunton three games to two, with one draw. In 1843, Howard Staunton of England stormed the fortress of the Café de la Régence itself, defeating Saint-Amant there eleven games to six, with four draws, in the second match to be generally recognized as a championship. Staunton carried the flag of European chess back to London, where both Philidor and Labourdonnais had found their last refuge, and where the first international championship tournament, with not just two but a whole field of contenders for the championship, was to be held in 1851. This “informal match” led to the “championship match” won by Staunton in Paris later the same year. The French players disputed this characterization of the two series of games, however. Toward the end of 1844, Staunton returned to Paris for a third match that would settle the matter for good, but he fell ill with pneumonia before it started and went home to England without having played a single game. The dispute flared up anew and then smoldered for years. In their separate capitals, Staunton continued to focus on chess, while Saint-Amant, still at the top of his game, reduced his playing to once a week, allowing Staunton’s claim to be the international champion to accrue legitimacy. In the late 1840s Saint-Amant retired from chess altogether, returning to it only intermittently during the last twenty-five years of his life. He had always had diverse occupations, including secretary to the governor of French Guyana, journalist, actor, wine dealer, captain in the National Guard, governor of the Tuileries Palace, French consul in California, and author of several nonfiction books, none of them on chess. A popular man, he was known for his sociability and civility. In sum, he had neither an intense drive to cultivate his skill in chess nor an intense drive to promote himself. In the first half of the nineteenth century, the Café de la Régence attracted players from every corner of Europe. Some sought only to joust with French knights on level ground. This wish was not always granted: Labourdonnais, as we have seen, imposed unreasonable odds on Szén, and Saint-Amant avoided the Hungarian altogether. Other, bolder paladins took up permanent residence in the palace of the royal game. But the valiant foreigners scarcely even postponed, let alone prevented, the collapse of its battlements in the 1840s. Lionel Kieseritzky arrived in Paris in 1839 from Dorpat, Livonia (now Tartu, Estonia), in the Russian Empire. As previously mentioned, Kieseritzky was an excellent amateur pianist and, an acquaintance later recalled, “through his active literary and artistic propensities, the social center, so to speak, of Dorpat; he staged dramatic and musical performances frequently and with great enthusiasm.” On the eve of his departure from his hometown he produced in a public garden a game of “living chess,” in which costumed people took the place of the chessmen. In Dorpat he had been teaching mathematics but once in Paris began to teach chess instead, giving lessons for a fee in the Café de la Régence. By the time of his arrival there he had already progressed to a level only slightly below that of Labourdonnais and about equal to that of Saint-Amant. In 1846 he visited London and engaged in a curious triangular match with Staunton and a German player named Harrwitz, each of the three playing the other two in simultaneous games, Staunton giving rook odds to both of the others, who played blindfolded; Harrwitz won his two games and Kieseritzky lost both of his. In 1849 Kieseritzky launched a new chess journal, La Régence, Saint-Amant having abandoned chess and allowed Le Palamède to expire in 1847. Kieseritzky invented a three-dimensional version of chess, but it failed to attract much interest. He played a lot of blindfold chess, including one simultaneous blindfold exhibition of four games, a new record, in which he called out his moves for each game in a different language, French, German, English, or Italian. In 1851 he again traveled to London, to participate in the first international championship tournament, where he was knocked out in the first round. A contemporary described him as “essentially a gallery player, dealing chiefly in fireworks against weak opponents.”  He cultivated chess as a spectacle intensively but did not cultivate chess as a skill comparably. The careers of these relatively unsuccessful successors to the Café de la Régence dynasty signaled the end of an era. It had lasted roughly a century, from about 1740 to about 1840. What the Age of Revolution was to European society at large, the Café de la Régence era was to chess: the childhood of many of its most characteristic present-day institutions. The chess club; the chess journal; the international championship match; subspecialties such as imaginative writing on chess subjects, problem composition, and simultaneous blindfold exhibitions; the study and publication of systematic analyses as an essential part of mastering the game; and, in general, a commitment to chess commensurate with that to any art or science: These are some of the distinctive institutions of modern chess that took form during the Café de la Régence era. The glory years of the Café de la Régence, whose traditions prevailed until the new institutions established themselves, were indeed those of a regency. In a broader societal context, out of the Café de la Régence period emerged the idea that chess greats are cultural heroes. A prominent French poet wrote that Labourdonnais had avenged Waterloo with his victory over MacDonnell in 1834. The French government bestowed a pension on Labourdonnais for his contribution to the national culture. Since then, becoming a great chess player has been regarded as a great accomplishment, without qualification. 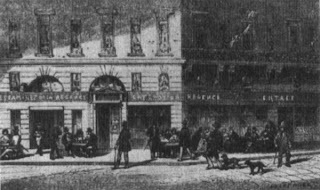 In 1852 the Café de la Régence lost its original home on the place du Palais-Royal. It found temporary quarters on the rue de Richelieu for two years, then it moved permanently to the rue Saint-Honoré located near Louvre and Palais Royal. The legendary Chess Cafe doesn't exist anymore, but if you want to visit the place where it was it was located at 161 rue Saint-Honoré. Dieses Matt trägt bis heute den Namen “Légal-Matt”.